A Seoul court this morning sentenced a former South Korean health minister to two and a half years jail for his role in a corruption scandal that led to the impeachment and arrest of former president Park Geun-hye. The ruling is one of the first from several ongoing trials that emerged from the scandal, including that of Park herself and Samsung Group chief Jay Y. Lee. Moon Hyung-pyo, a former minister of health and welfare during the Park administration and subsequent chairman of South Korea's National Pension Service (NPS), had been indicted and arrested last December. 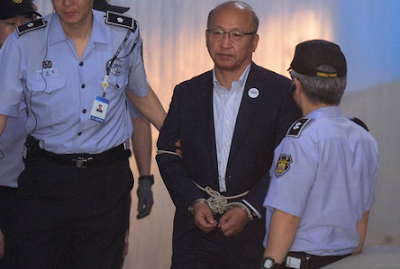 He was accused of abusing his authority as minister to pressure the NPS to cast a key vote in favor of the $8 billion merger of two Samsung Group affiliates, Samsung C&T Corp and Cheil Industries Inc in 2015. The health ministry supervises the NPS, which held a substantial stake in both companies. The NPS supported the merger deal in 2015. The Seoul Central District Court said Moon had "severely harmed the independence of the NPS by pressuring it through health ministry officials", sentencing him to two and a half years in jail, according to Yonhap. Moon had denied the charges. Prosecutors have argued Jay Y. Lee and other former Samsung Group executives gave bribes to Choi Soon-sil, Park's long-time confidante, and in return, received political favors and government support for the 2015 merger, which prosecutors say transferred control of the key company to Lee from hospitalized patriarch Lee Kun-hee at the expense of other shareholders. Jay Y. Lee, held in detention and undergoing trial on charges such as bribery and embezzlement, has denied all charges. Choi and Park, also in detention and undergoing trials on charges such as abuse of power and extortion, have also denied all charges.